During the winter we love all things related to SNOW! This week we are sharing some Snowman themed activities in our Toddler Approved Newsletter and here on the blog! Have you ever done any of our name activities with your toddler or preschooler? One thing that gets kids excited about learning is by tying in something they love (example: snow!) and something that is meaningful to them (like their name!). Our Snowman Name Hunt is the perfect combination! 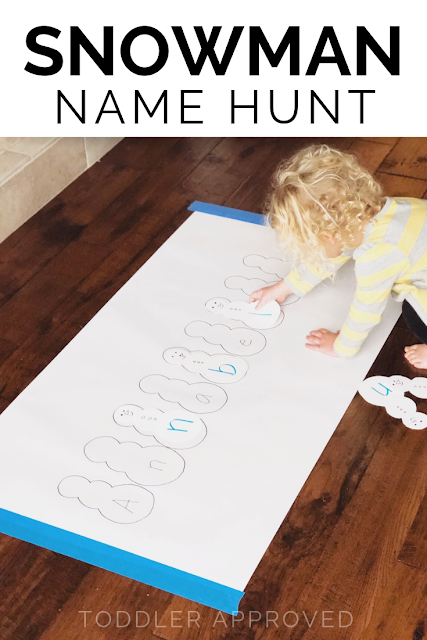 Name activities are some of our favorites because they are such simple ways to introduce toddlers to the letters in their names. Names are so important to kids. They love hearing their names and learning about them. They love learning their friend's names too. When you're introducing kids to the alphabet, why not start with the most important letters? -- the letters in your child's name? Prep: Start by drawing and cutting out snowman. You will need one for each letter of your child's name. For example, for my daughter Annabelle, she needed 8 snowmen. Draw the letters of your child's name on the snowmen, one on each snowman. Next, put a large piece of paper on the floor. Tape it to the ground and then draw an outline around each snowman to make a little snowman name puzzle. See if your toddler can match the snowmen to their outlines. Now you're ready for the snowman name hunt! Hide the snowmen around the room while your toddler attempts to cover her eyes and counts. See if she can find the snowmen and bring them back to match them to their outlines. Add tape to the snowmen if it is easier to help them stay in place. 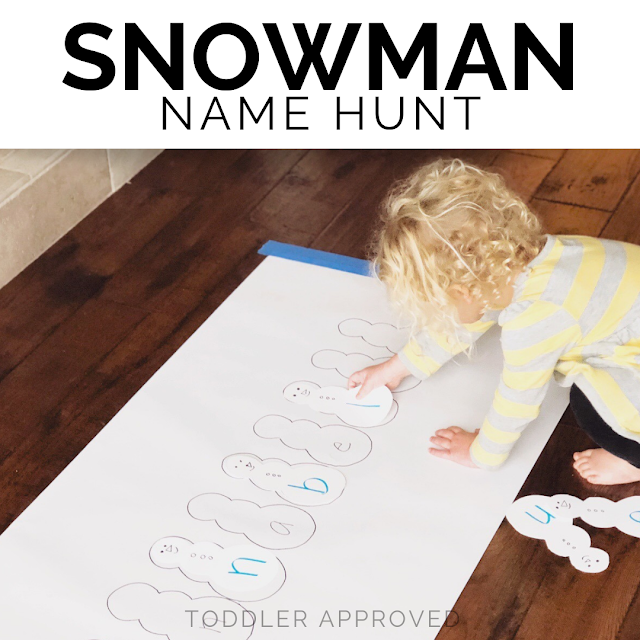 Once your toddler is done matching the snowmen to her name, you can hide the snowmen and play again! 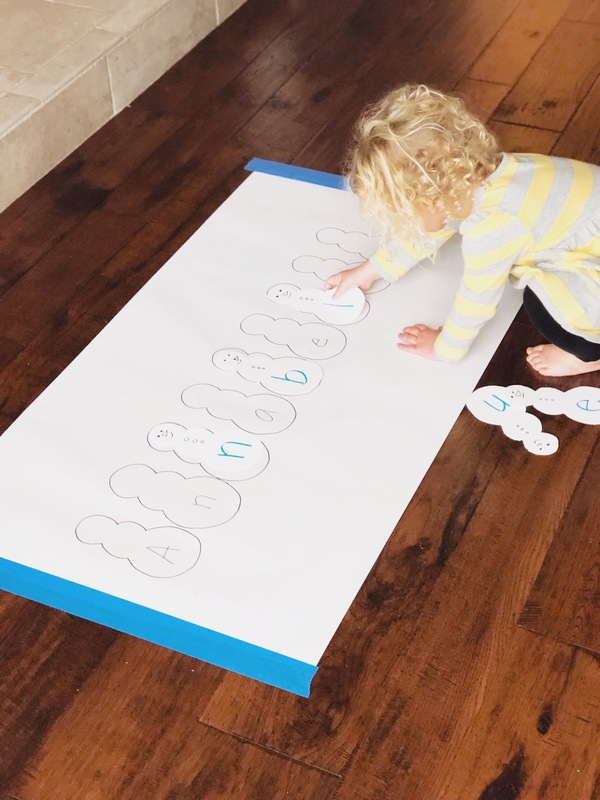 This activity is so simple, but practices letter recognition and visual discrimination as she tries to distinguish between the different letters and find the right one! If you liked this name hunt, you might enjoy some of our other simple name activities. Most are pretty easy to adapt to different themes.